I know what you’re probably thinking right now, “You cooked twice in one week, let alone in one day?” You must be feeling feverish right? Well, I’m just trying to get ready for a week back to work after 10 whole days off. They weren’t completely off since I did still have school, but it was relaxing none-the-less. I worked out a ton (crossfit rocks, I’m sure I’ll be doing a post about that real soon too), read a few books (currently really into the Stephanie Plum series), bought a new/used beach cruiser and actually had sunny enough weather to use it, and did homework. I found this recipe through Pinterest. The original can be found here on the Alaska from Scratch blog. To a cast iron skillet over medium-high heat, add the oil and butter. Stir in the red chile flakes. Saute the onions and jalapeño until tender, 2-3 minutes. Add the garlic and stir until fragrant, but not browned, about 1 minute. Toss in the tomatoes and cook until the tomatoes begin to break down and release their juices, another 2-3 minutes. Add the chicken broth and bring to a simmer. 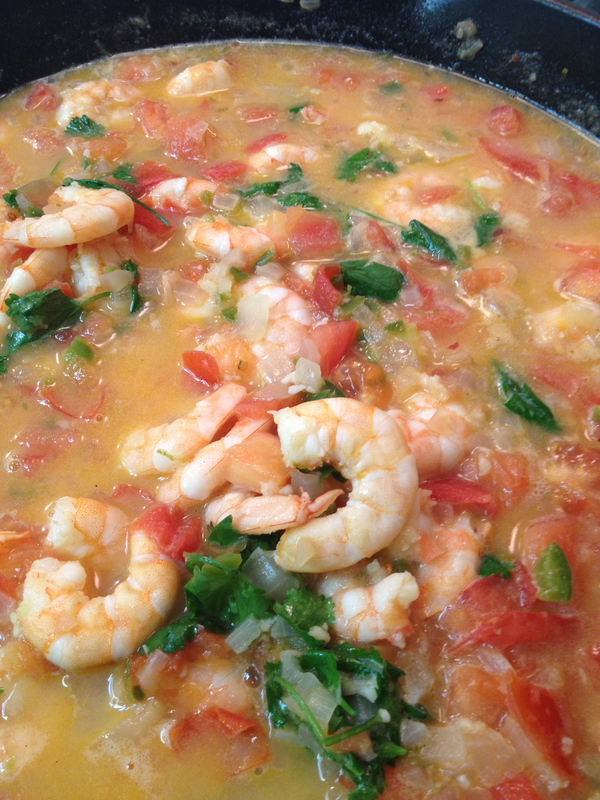 Then, add the shrimp to the skillet and season with salt, cooking and tossing until shrimp just turn pink and are cooked through but still tender, being careful not to overcook. Add the lime zest, lime juice, and cilantro. Taste for seasoning and add more salt as needed. Serve promptly with crusty bread, or over rice or noodles. I served mine over cauliflower rice (paleo friendly). The next time I make this I will attempt to try to remember that it is worth it to spend more on the shrimp and not have to peel them yourself, what a pain! Also, I’d opt to use ½ cup of chicken broth rather than a whole cup because mine turned out much runnier than the original picture. It’s very good though, very limey and of course I added extra garlic (because that’s what I do)! I’ve recently ventured into the world of paleo eating/cooking. I’m not exclusively eating paleo, but I am as much as possible (or when I’m not cheating). I recently ate nothing that wasn’t part of the paleo diet for about two weeks and noticed a big drop on weight, not to mention the fact that my stomach would no longer tolerate the “bad” foods. But, I’ve been on vacation (at home, a staycation if you will) and although I’ve managed to do pretty good I did have a few cheat nights. Tonight I’m cooking for my work week. Getting ready to get back into the swing of things. My friend G posted this recipe on his Facebook the other day and I wanted to try it out. It’s a repost from another Facebook page called $5-10 Dollar Meals – Cheap Eats which you can find here. For some reason my local grocery store doesn’t carry one pound packages of chicken breasts, and the smallest I could find was just over 1 1/2 pounds. So, I adjusted the spices ratio accordingly and made the entire package. For the record, I was able to purchase everything (except the garlic powder, I was out) for $12.95. Not within their $10 range, but our grocery store here is insanely expensive. If you live somewhere that is not out in the sticks you could probably make this exact recipe for $8 or less. Preheat the oven to 400 degrees. 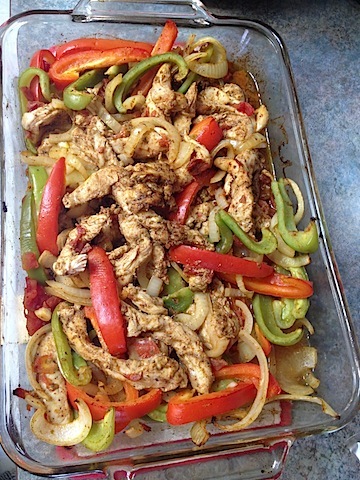 Place chicken strips in a greased 13×9 baking dish. In a small bowl combine the oil, chili powder, cumin, garlic powder, dried oregano, and salt. Drizzle the spice mixture over the chicken and stir to coat. Next add the tomatoes, peppers, and onions to the dish and stir to combine. Bake uncovered for 20-25 minutes or until chicken is cooked through and the vegetables are tender. I’m also thinking it would have been better to let the chicken breasts marinate in the oil/spice mixture, but it was still really good!